Animation The home page animations have been designed to transition the user to relevant content with ease and comfort. Each of the widgets on the page have an active and inactive state. 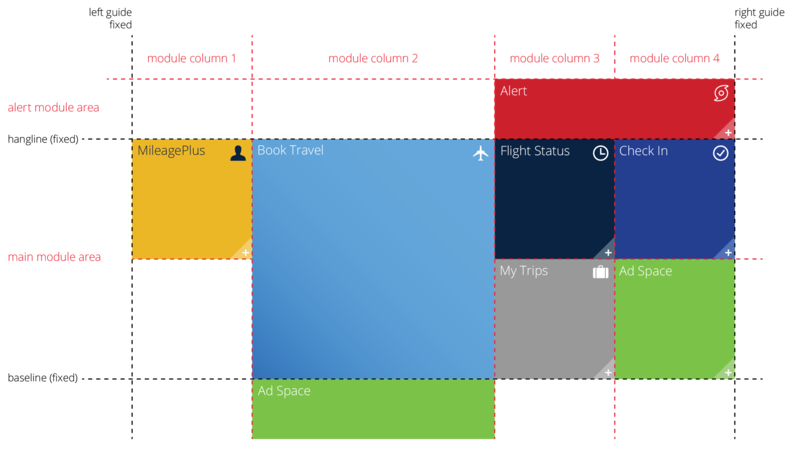 In the active state, the widget is open and allows the user to enter and select data relevant to their travel needs. In the collapsed state, the widgets will give a summary of the information the traveler has already entered. 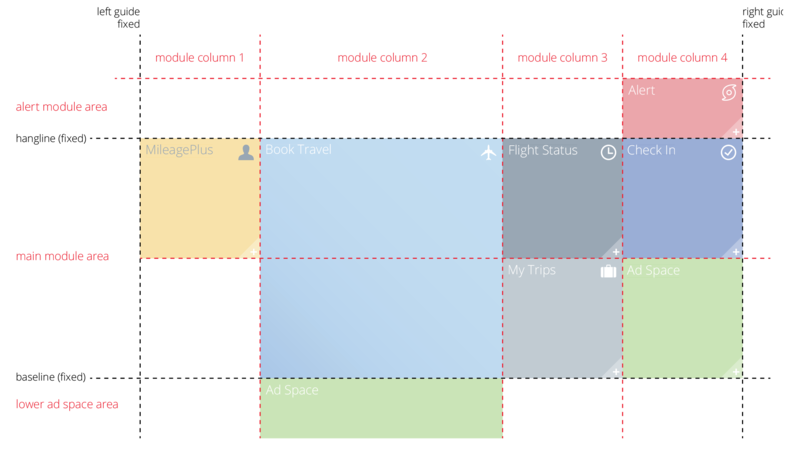 Book travel Once the Book Travel widget is expanded, the user is allowed to search for a flight, by specifying the departure and arrival dates, selecting a cabin class, and choosing who the travelers will be. In this widget, there are also options to search for hotels, rent a car, select a cruise or view vacation packages. In most cases, this will be the active widget when arriving at the home page. MileagePlus Once the MileagePlus widget is expanded, the user is allowed to either sign in or join with a new account. Once signed in, the widget will display the members number, mileage balance, travel bank, upgrades, segments, and premier dollars. From this widget you will also be able to see the full account. Flight status Once the Flight Status widget is expanded, the user is allowed to enter either flight number and date or departing and destination cities to view the desired flight details. Once entered, the widget will display flight numbers, if the flight is on time, weather, terminals, gates, and plane type. 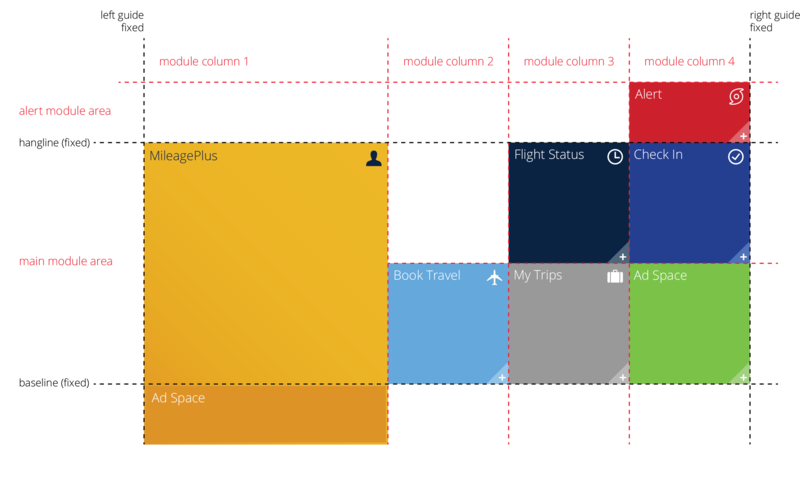 The user will also be able to view and select the upgrade list, standby list, seat map and list of amenities for the flight. In the collapsed state the widget will list if the flight is on time or delayed. 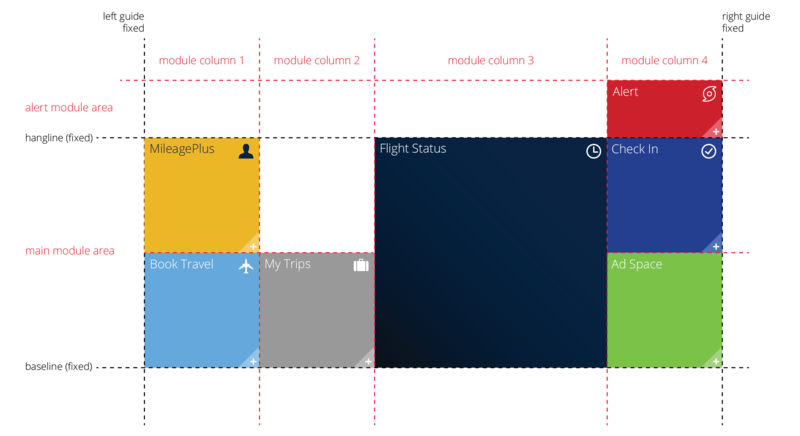 My trips Once the My Trips widget is expanded, the user is allowed to enter either the confirmation number of their flight to see flight details or the confirmation number of their rental car agreement to view rental details. Once entered, a summation of both will be displayed in the widget. When collapsed, if the traveler has a saved itinerary, the number of upcoming trips will be displayed. Check in Once the Check In widget is expanded, the user is allowed to enter their specific travel information and check in for their flight. 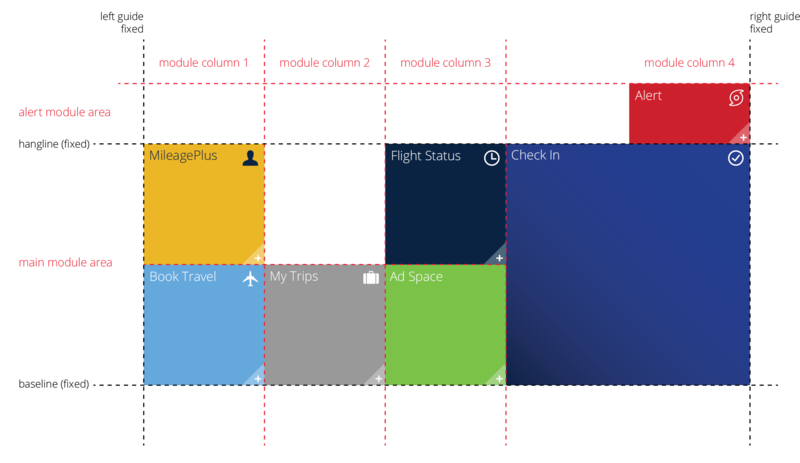 Once checked in, the user will be able to see a summary of their booked flights, current weather, travelers involved, and notifications pertaining to their travel. When collapsed, if the traveler has a saved itinerary, it will be displayed in summation. System alerts When there is a System Alert, the alert widget will appear in the upper right portion of the module grid. 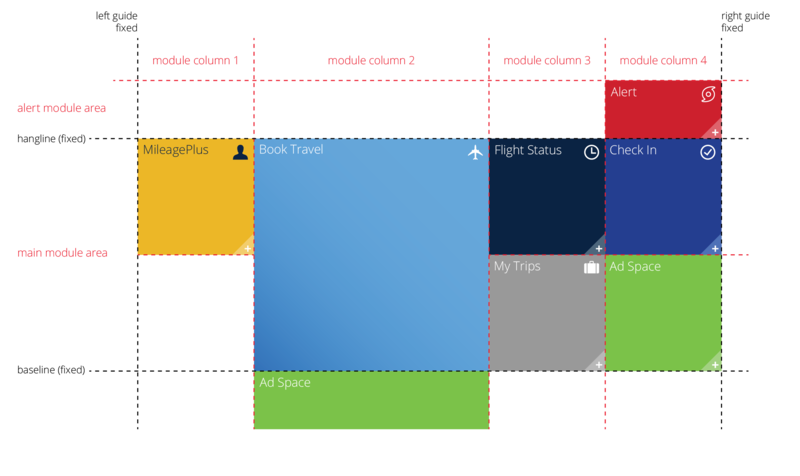 If there is more than one alert or additional information is needed, the alert module will double in width but remain the same size in height. The proper icon will appear in the top right corner of the widget for quick reference as to what the alert messaging pertains to. 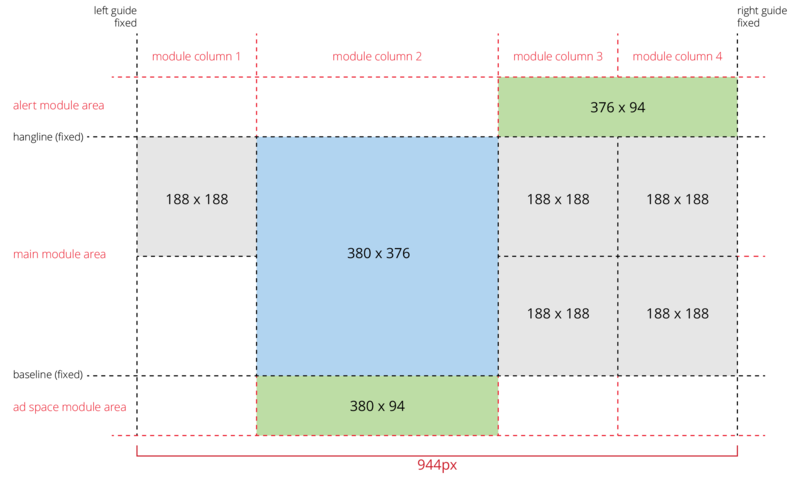 Homepage grid The home page modules are set up to fit within a grid with a 940 pixel width. All tiles will have an active and inactive state. Each tile when active will have a set size of 380 pixels wide by 376 pixels tall. 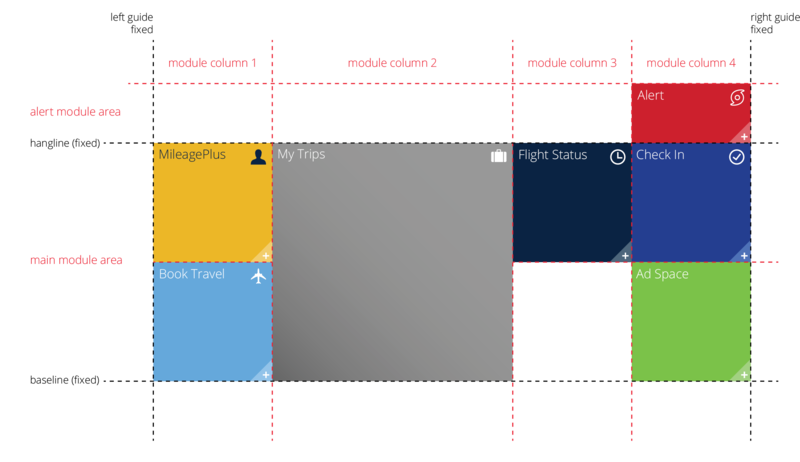 Active tiles will allow the user to input data in order to gain access to their travel information. All inactive tiles will be set to a size of 188 pixels by 188 pixels. Inactive tiles will show a very brief summary of the information contained within.